Over the last two decades, scientific accounts of religion have received a great deal of scholarly and popular attention both because of their intrinsic interest and because they are widely seen as potentially as constituting a threat to the religion they analyse. 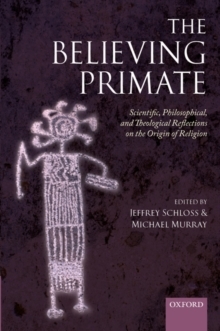 The Believing Primate aims to describe and discuss these scientific accounts as well as to assess their implications. The volume begins with essays by leading scientists in the field, describingthese accounts and discussing evidence in their favour. Philosophical and theological reflections on these accounts follow, offered by leading philosophers, theologians, and scientists. This diverse group of scholars address some fascinating underlying questions: Do scientific accounts of religion underminethe justification of religious belief? Do such accounts show religion to be an accidental by-product of our evolutionary development? And, whilst we seem naturally disposed toward religion, would we fare better or worse without it? Bringing together dissenting perspectives, this provocative collection will serve to freshly illuminate ongoing debate on these perennial questions.